After India won three One Day Internationals in a row, and thereby winning the series, New Zealand won a match. Not only did the home team win the game, they won by eight wickets. New Zealand won the toss and chose to bowl first. The hosts made quick work of the visitors, restricting their total to 92 runs. New Zealand took 10 wickets in just 30.5 overs. Trent Boult won Man of the Match for his five-wicket haul. New Zealand effortlessly chased and reached India’s very small run total with 93/2 in 14.4 overs. Rohit Sharma, stood in as skipper after Virat Kohli, with the series won, decided to take a break. This was Sharma’s 200th ODI match, and unfortunately for him, it will not create good memories. It was also Shubman Gill’s debut international ODI. 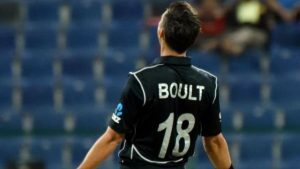 Trent Boult certainly put a damper on Sharma’s 200th ODI and Gill’s debut ODI. Sharma noted that this was one of India’s worst batting performances in quite some time. Despite the ball swinging, and the less than optimal conditions, Sharma felt the team should have coped better. He is hopeful that the team learns from their mistakes, and that the final match will see a big improvement. As expected, Sharma gives credit where credit is due, and complimented the Kiwis on their quality bowling. There is still one more ODI left of the series. While India may have won the series, the team will not want a repeat of the dismal fourth ODI. The final game takes place on Sunday, 3rd February 2019 at Wellington. There are a few days between the fourth and fifth ODIs. This gives India time to reflect on mistakes they made, and prepare for the final game.